Chrichton's World: Review The Forest (2016): Waste of potential! Review The Forest (2016): Waste of potential! The Forest fails to get the most out of some promising elements. Read on why this is a shame. First and foremost it´s the setting. Aokigahara a.k.a. suicide forest. A place where people wander about to commit suicide. If that is not enough to make your skin crawl then I don´t know what is. But the fact that this forest is in Japan alone should make the most skeptic horror fan happy. Japanese ghosts anyone? Those pale long and black haired women that walk funny? Come on that is always creepy. At least this was what I was expecting. Strangely enough while ghosts are mentioned there aren´t that many to be found in this film. Whaaaaat? Yep, you read right. Why would you let the film take place in Japan and not feauture the traditional Japanese ghosts? It does not make sense to me. But I am not one to write off a film because of one big mistake like this. 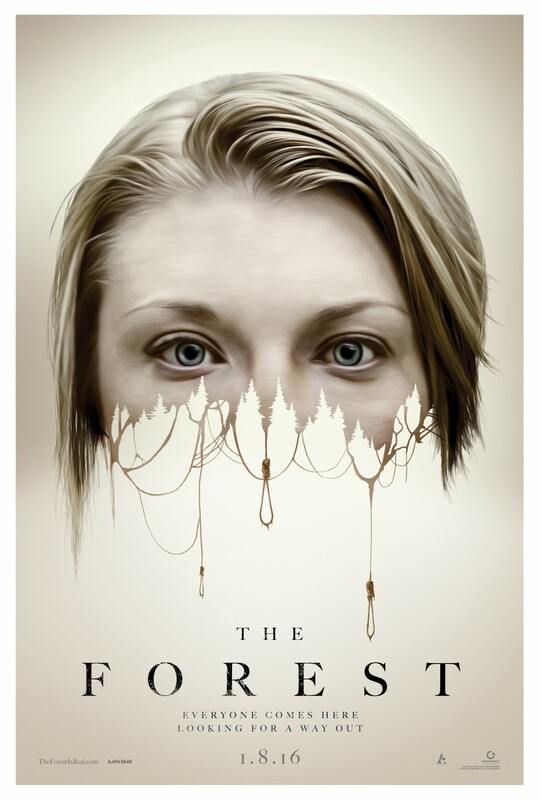 The forest itself could have brought enough eeriness to make up for anything the film is lacking horror wise. Unfortunately the forest never looks menacing or creepy. I don´t understand how this is possible. I am sure anyone can think of one near you where you wouldn´t think of going to at night. It must be the lack of understanding how to use light effectively or failing to grasp the basics of what terrifies people. That being said there are one or two scares that were effective. Of course this is not enough to keep the viewer satisfied. Especially since the supposed mystery hardly gets time to develop and therefore is not that interesting. Even worse is how it gets resolved. Everything at the ending is rushed to a point that nothing makes sense. I tried real hard to approach the events from a psychological angle but that is a pointless exercise since there is nothing in the film to back that up properly. All the film offers is random twisted acts without motivation or explanation. And these acts are left vague to keep things mystical in the worst way possible. No imagination whatsoever. The only reason why I kept watching was the adequate acting by Natalie Dormer and Taylor Kinney. Especially Kinney shows what he is capable off. Dormer´s character is impulsive, stubborn and incredibly stupid. I am sure that director Jason Zada thought he was being clever and was going for making her seem mentally unstable. But there is nothing to back that claim up. For some reason I was also expecting some big twist that would make this average horror into a brilliant one. Safe to say that probably was too much to hope for. So many things could have been done with the premise and the setting. What is the point of having the story situated in Japan to then make that detail count? I can´t recommend this one even when in hindsight it´s not that bad.